This is cross-posted from West of the Loop, the blog written by one of the Chicago Food Swap organizers, Emily. Last weekend was the inaugural Chicago Food Swap organized by me and my partner-in-crime, Chef Druck. As I have explained before, food swaps are the latest foodie craze and are sweeping the country from Los Angeles to Austin to Philadelphia. These events bring together passionate home cooks, gardeners and social media mavens in a friendly, non-commercial atmosphere to swap their homemade (or homegrown) edibles. No money changes hands. Everything is done by barter. The end result is that participants meet like-minded people from their own city, everyone diversifies their pantry and, with any luck, walks away inspired to push their culinary boundaries a little further. As with any new enterprise, our first Chicago Food Swap started small. But our little group brought a wide variety of offerings and was very convivial. I naturally brought some of my jams and pickles, including strawberry balsamic jam, pickled asparagus and apricot-habañero jelly, to swap. Local personal chef and food blogger Angie brought several varieties of cookies, including the best gingerbread men that I have ever tasted. (They are chewy, not crispy, which is the key to their deliciousness.) Food blogger and digital media guru Jessi brought 16 loaves of homemade foccacia topped with carmelized onions. Wow. My family polished off a loaf of that foccacia that same night. Chef Druck brought her homemade jam as well as cookies. And among the other delicious offerings were pumpkin bread, currant scones, ginger martini syrup (!) and hot buttered rum mix — just add rum and boiling water. Unloading my bag when I got home that evening was like a foodie Christmas morning. One of the best things about the first Chicago Food Swap was that it turned into a family affair. Chef Druck announced the week before the Swap that her eldest daughter, Bella, who has become something of a baker lately, wanted to participate in the Swap. I shared this information with Zuzu, who is two years younger than Bella and therefore thinks Bella is pretty much the coolest person ever. Naturally, Zuzu wanted to come as well. Bella made adorable Reindeer Rice Krispie Treats to swap and Zuzu whipped up some mini-loaves of her favorite weekday snack, chocolate chip banana bread. Another swapper Jacky, of the hot buttered rum mix, ended up bringing her eleven-year-old, and my friend Rowena of the fashion and lifestyle site She She Shoppers brought her daughter. The four girls had fun sizing up all the swap offerings and browsing at the upstairs boutique. Speaking of upstairs, our hosts for the swap, the Forest Park alternative craft boutique, Pretty Little Things, was almost as much of a draw as the food was. When I approached the owners about using their downstairs space for our swap, they immediately expressed their interest. Their store is all about featuring unique handmade items so the zeitgeist of the food swap movement — which showcases handmade products — really appealed to them. Sisters Signe and Binky could not have been more gracious and accommodating hosts and Chef Druck and I are very grateful to them for letting us use their space for free. They did get a little something out of it. All of the girls found some items at the store that they could not live without. Both Bella and Zuzu went home with a pair of hand-knitted fingerless gloves, which I suspect will be come The Next Big Thing at their elementary school. If you are looking for unique holiday gifts this season and are local, definitely check out Pretty Little Things for unusual and handmade apparel and home decor. Chef Druck and I are already gearing up for the next Chicago Food Swap, which is tentatively scheduled for February 11. Location TBD. As much as I would love to be at Pretty Little Things again, we are hoping for a larger group this time around. And with that, a more central location. 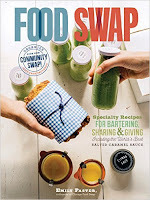 If the idea of a food swap sounds at all appealing to you, I hope you will join us in February. To hear about the latest updates of the Chicago Food Swap and to find out when registration for the February Swap opens, check out our website, follow us on Twitter or like our Facebook page. And stay tuned!